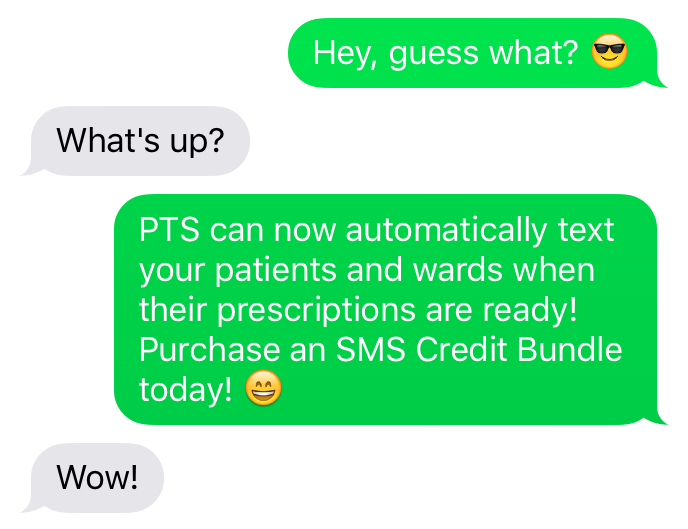 PTS can now automatically text your patients when their prescriptions are ready for collection! By making a note of the patient's phone number, PTS can automatically generate and send an SMS message as soon as the prescription is complete, with no additional steps to the dispensing process. You can even send a text message to a ward when certain prescriptions are ready, such as when an urgent or important script is ready for collection. Upon purchase, a PTS SMS account will be created for your organisation with the appropriate credits applied to it once payment is received; alternatively for repeat customers your account will simply be topped up by the relevant amount upon receipt of payment. We will also send you our short and simple setup instructions to get you up and running in no time.